Writer Brian Michael Bendis (Scarlett, Young Justice) almost pulled a fast one on me in this week with Superman #10. I completed the book satisfied I read a pretty OK Superman issue, a step-up from recent quality. I prepared to write this review and reflected on the book. Slowly I realized the overall story barely progressed and payoffs to lingering mysteries are major letdowns. It’s a blessing Bendis has tremendous artists on Superman, they mask many of his deficient writing efforts. Ivan Reis (Justice League, Aquaman) is the primary artist with help from Brandon Peterson (Uncanny X-Men, Codename: Strykeforce.) I’m not sure what it is exactly, but the art appears to take a step backward this week. It’s still good and easily the best feature in the series. Alex Sinclair (The Flash, Batman Hush) is the color artists and his work is excellent, as readers have come to expect. Superman #10 features multiple extensive set pieces, impeccable detail work and the return of Jor El. 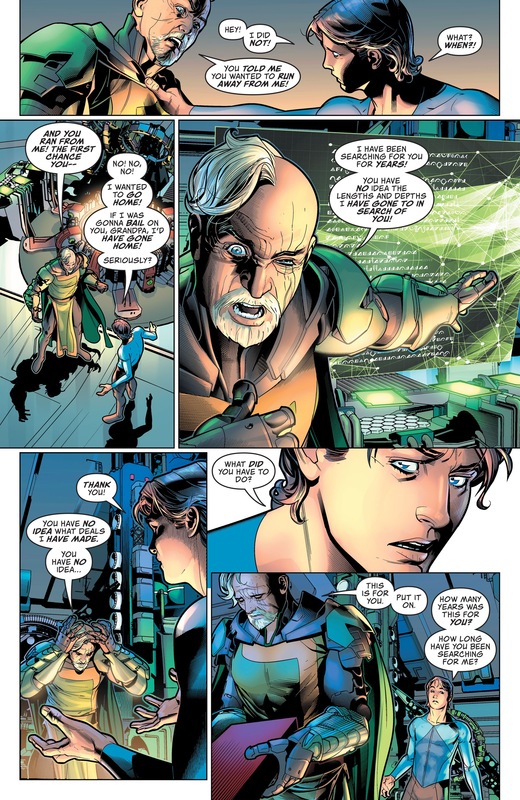 Jor El appears aged and considerably weathered since his last appearance, which plays heavily in to the story. Reis and Peterson are at their best when the action is hot and heavy. It’s unfortunate Superman does next to nothing the entire issue. The team do their best to elevate multiple static pages of conversation but this issue, and the series as a whole, are a huge waste of their time and talents. Bendis’ take on Superman is severely lacking and Reis, Peterson and Sinclair deserve to move to better titles to showcase their abilities. 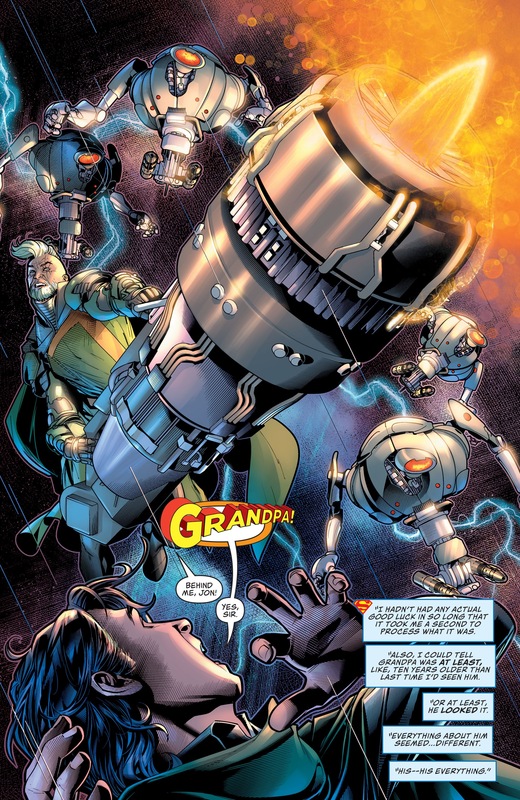 Despite the best efforts of Ivan Reis and the art team, they can’t fully mask the deficiencies in Bendis’ writing. Bad dialogue and lackluster pay offs weigh down Superman #10 throughout. Issue 10, like 9, is Jon explaining to his parents what happened during his 7 years in space. 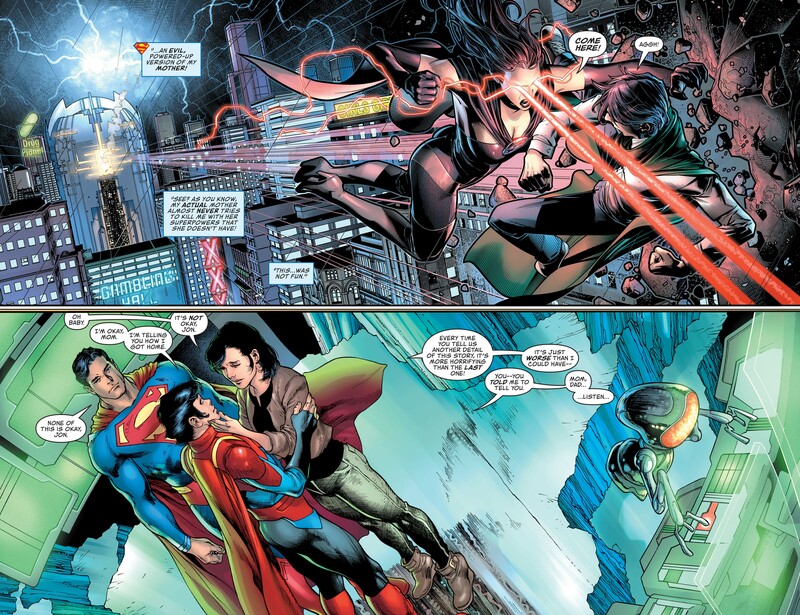 Eath-3’s Superwoman, an evil super-powered version of Jon’s mother, attacks him. He says, “I wasn’t going to fight her—you” and then delivers Bendis’ eye rolling dialogue, “I was happy to find out I had no pent-up stuff about you that this could have triggered.” No human or Kryptonian speaks like this and it reads terribly. Bendis also continues butchering Lois Lane’s character, at one point she refers to Jon directly as “boy” rather than his name. I’m unsure how this dialogue made it through the editorial process. 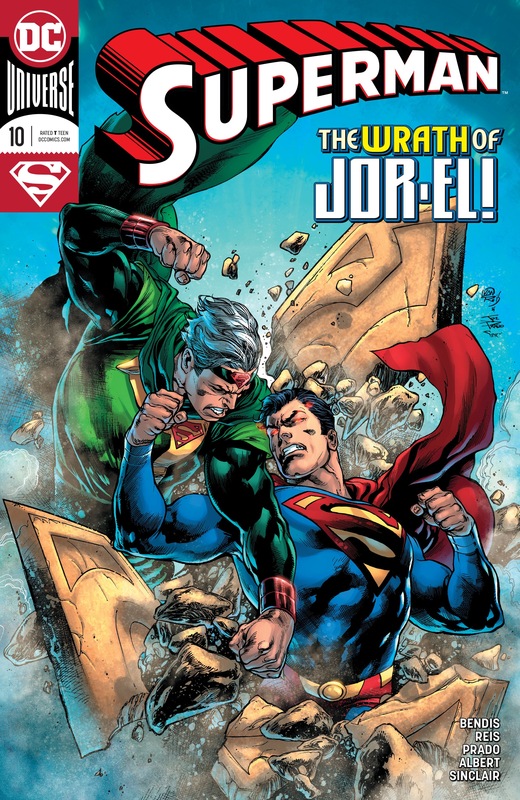 The return of Jor El and his further descent in madness features heavily in Superman #10. After recusing Jon from Superwoman he explains all he’s been through trying to locate him. The search takes a clear physical and psychological toll. Expressing regret Jor El exclaims, “You have no idea what deals I have made. You have no idea…” Jor El provides a very dense explanation of how Jon arrived on Earth-3 (it doesn’t exist in current timeline) and, while it makes sense, it’s not satisfying. Rogol Zaar and crew arrive looking to take Jon when Jor El shoot him with energy, sending him crashing to Earth. The payoff to the mystery of Jon’s 7 years in space and return to earth fall flat and feel lazy. It appears the story is returning to Rogol Zaar, the villain introduced early in the series and never mentioned again until this issue. Every month is another reminder that Bendis writing Superman is a bad idea. Not only has he ruined the character and his family but his stories are treading water. I’m glad Superman does something of substance next month (he’s done nothing heroic for months now) but issue 10 is complete waste. For a more in-depth review check out my video below. Wes is a christian, husband, father and comic industry YouTuber. He has commanded satellites, worked inside a mountain and served in the Afghan War. He has journeyed the globe from Alaska to England to the republic of Korea. Wes is a proud expat, living with his best friend and wife and their exceptional son. For more comic industry coverage check out Wes's Youtube channel. NEXT POST Next post: Mark Waid Pushes Politics Thru Tragedy in Humanoids!